space, Brick House Blue, is set to open January 2 at Bridge Park. Coworking offers business services, space and a community atmosphere, supporting growth of entrepreneurs, start-ups and virtual/remote workers. Brick House Blue’s 9,000 sq. ft. facility provides unique spaces for collaborative coworking along with four large meeting rooms designed to host company meetings, networking opportunities, off sites, and much more. The venue’s co-founders Cid Rhomberg and Dave Mirgon will also offer facilitation, team building programs, and leadership development platforms across a variety of competencies. Brick House Blue’s motto is Discover. Build. Grow. Discover one’s goals or strengths, Build a plan or skills to accomplish said goals and continue to grow and stretch. Brick House Blue will be the first venue of this nature to join the vibrant Bridge Park community which is already home to a variety of restaurants and entertainment venues. Construction began in July to turn the site into a space that has deep character and the vibe to support innovation and creative needs. Coworking members have begun booking their offices, desks and meetings. 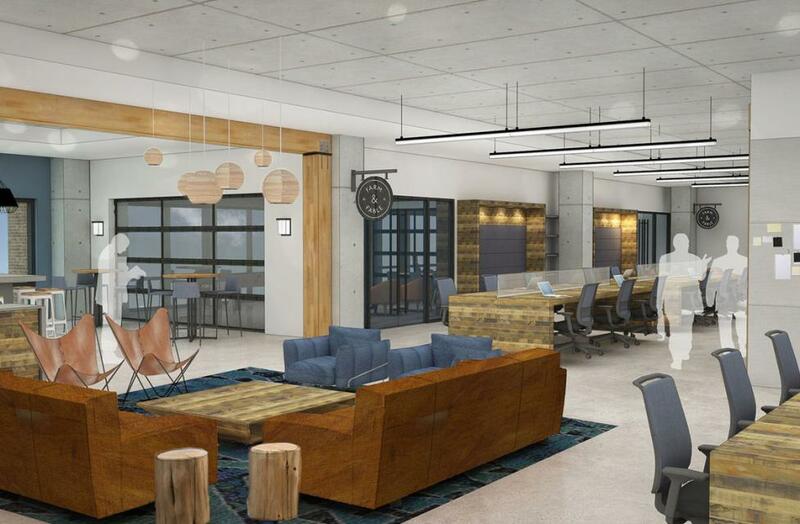 Brick House Blue will offer coworking members and guests options of dedicated desks, private offices, conference rooms, outdoor balcony space, a kitchenette, and more. As a member, dedicated workshops and programs will be available to assist individuals and companies in building business acumen and skills to support business growth. To learn more about the membership benefits and event space, please contact Jen Szymczak at 910-233-2483 or via email at jens@brickhouseblue.com. Brick House Blue is a coworking space for businesses from Fortune 500 to freelancers located in Dublin, Ohio at Bridge Park. Brick House Blue can be used as creative meeting space for off-site meetings, retreats and and team building, allowing businesses and teams of any size to find new ways to discover, build and grow. Brick House Blue also provides executive coaching, consulting and leadership development. For more information on Brick House Blue, visit www.brickhouseblue.com. Kimball® Office has been transforming workspaces for over 40 years, with an ever-widening breadth of relevant, sustainable office furniture solutions. As one of America’s most respected environmentally-conscious contract office furniture manufacturers, they provide architects, designers, facility managers, and employers with open plan system solutions, both modern and classic desking, and a range of seating options. The company is a brand unit of Kimball® International Inc., (NASDAQ: KBALB), a $1.1 billion publicly traded company headquartered in Jasper, Ind. Learn how Kimball® Office is changing workspaces by visiting www.kimballoffice.com.